Brand new ‘The Lion Man: Brand new ‘The Lion Man: African Safari' features Kiwi farm boy Craig Busch, an experienced self-taught "wild cat trainer", creates a haven for rare, endangered cats such as white Bengal Tigers, Barbary Lions and White Lions at a reserve near Johannesburg. Craig and a passionate band of animal-loving supporters heal desperately ill tigers, and attempt to track down unscrupulous rhino killers. He also seeks out like-minded animal experts and conservationists around the globe (including "Wolf Man" Shaun Ellis) to help with his cause. 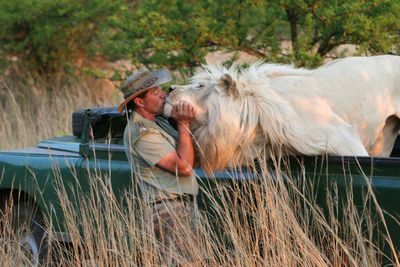 Along the way, he adopts and raises an orphaned White Lion cub named Jabula and lovingly hand-rears several Barbary Lion cubs. Craig travels across the world to begin a long struggle of enhancing the bloodlines of these rare cats to bring them back from the brink of extinction.